A career crisis is a phase everyone goes through at some point in time of their life. The earlier one gets it, it makes you better to anticipate somethings for yourself. 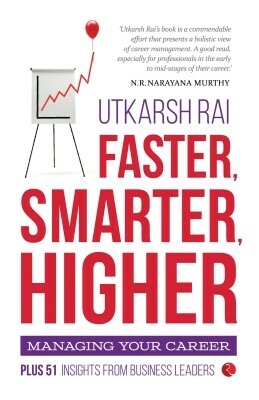 In this book the author Utkarsh Rai takes us through some of the most mind boggling times when we should have had the real experience of being faster, smarter and think higher. The author has made the book into 8 parts and each one is a testament on how you can manage different sets of values and sometimes people. The book provides ample insights in giving us the solutions in the form of What can you do? Quite often it’s this question that needs to be answered and that’s how it is done. The book quotes extensively from the experience and situations which we may come across and this holds very true in case of people to people interaction we may come across in the daily routine. I think this is an encapsulation in a very fine format which young budding managers need to learn a bit especially about managing their managers and their peers, this I think is a very new way to look at the career prospects and the people influencing the same. The quotes which accompany the chapters are very thought provoking and mostly application driven and has the ability to propel you to achieve what you want in your career. In hindsight when I look back I feel things could have been different if I had read something like this before early in my career and it could have really made a difference. I think this book is a go to guide for you whenever you need to go back and check and how you need to work on the situations that you come across. It’s more about people and how we manage them to get the best out of them. It’s a fast read in a sense but will hold your thoughts for a while and sometimes you might take time to digest and flip through to the next page. Another aspect is the simple straight talking language that is akin to speaking straight to you, making you comfortable and talking to you in a way that makes it easy to understand and help ourselves. Pick this book and this will be an immense help for yourself and will turn to be a go to guide for times to come.